In February 2016, a rescue excavation was conducted east of the Ashqelon marina (Permit No. A-7625; map ref. 158102–73/620741–90), prior to the construction of a parking lot. The excavation, undertaken on behalf of the Israel Antiquities Authority and underwritten by the Afgad Group, was directed by A. Golani (field photography), with the assistance of Y. Al-‘Amor (administration), M. Kahan (surveying and drafting), O. Barzilai (flint artifacts), N. Marom (archaeozoology), I. Ktalav (malacology), I. Lidsky-Reznikov (pottery drawing), M. Smilanski (flint drawing) and N.S. Paran, I. Peretz and S. Ganor. 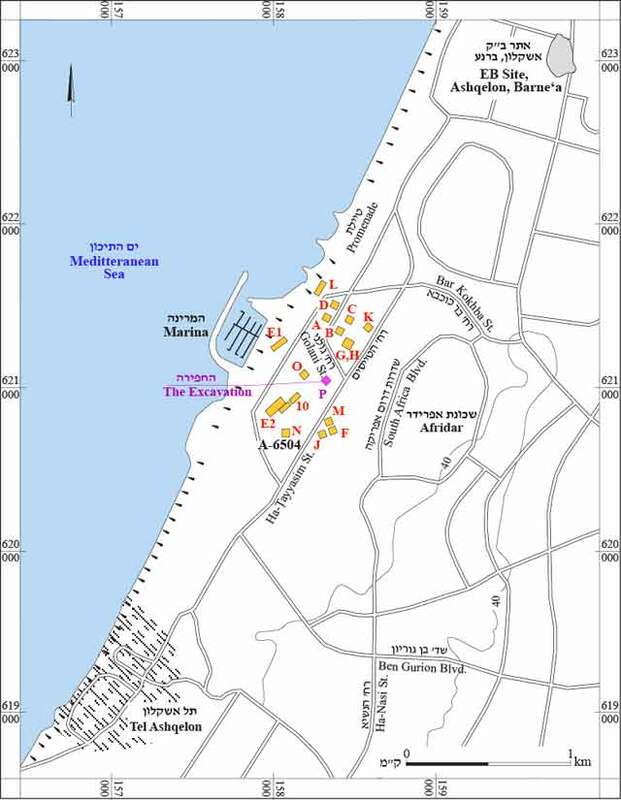 The excavation was situated within the confines of the Early Bronze Age I settlement at Ashqelon—a large site spread out over a long strip along the coast (length c. 5 km, width 1–2 km), from Tel Ashqelon in the south to the Barne‘a neighborhood in the north (Fig. 1). Within this area, a non-nucleated, shifting and apparently continuous settlement appears to have existed for nearly a millennium. Numerous radiocarbon determinations have dated the beginning of this occupation to 3800–3700 BCE and the abandonment of the settlement to 3000–2900 BCE (Golani 2013: Fig. 2). The ancient topography of the immediate region has been drastically altered due to the increasing buildup of sand dunes in the last two millennia and leveling caused by modern development. At the time of the EB I settlement, two long and wide kurkar ridges ran parallel to one another and to the coastline. In the trough between these ridges, a distinct ecosystem was created wherein fertile soils and a high water table created optimal conditions for habitation. The position of the ancient settlement adjacent to the coast suggests the possibility of a nearby anchorage, and a wide passage in the sand dunes to the east that facilitated access from the inland regions to the coast posits this region as a convenient stop for overland and maritime trade. The present excavation (Area P) is one of many that have revealed remains of the EB I occupation in this region (Gophna 2002; 2004; Wallach 2003; Baumgarten 2004; Braun and Gophna 2004; Golani 2004; Khalaily 2004; Golani 2005; Baumgarten 2006; Golani 2007; Golani 2008a; Golani 2008b; Haimi 2009; Toueg 2010; Golani 2014; Golani and Paran 2014; Paran 2014). Many of these excavations revealed remains of a developed metallurgical industry that apparently made Ashqelon a wealthy trade entrepot during the EB I period. Area P is situated 60 m southeast of a previous excavation (Area O; Paran 2014) wherein two clear occupation strata with architectural remains from EB I were revealed. Prior to the excavation, a thick overburden of light brown sand (thickness 2.5 m) was removed mechanically down to a layer of dark brown sandy soil representing the top of the EB I occupation. The sandy overburden contained a meager amount of ex-situ finds dating primarily to the Late Roman and Byzantine periods that often penetrated the dark brown deposits below. 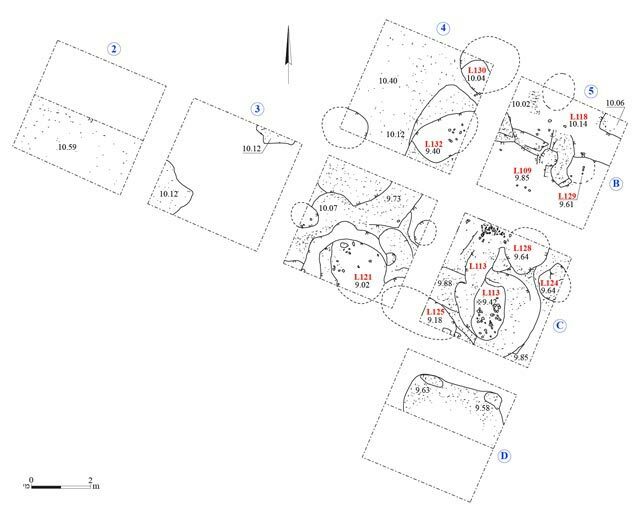 Consequently, seven excavation squares were opened to examine the nature of the EB I occupation in this area (Fig. 2). The excavation revealed a thin occupation accumulation (0.1–0.3 m) characterized by a dark brown soil found directly upon a sterile layer of light brown-yellow sand and husmas soil—a light brown conglomeration of sand and marl that included numerous kurkar chips. This husmas formationwas often encountered in previous excavations at the site and was widely used as raw material in the manufacture of sun-dried mud bricks and terre pisée walls. The original ancient topography in this specific area appears to represent a mild slope (6 degrees) descending to the east. No clear architecture was revealed in the present excavation, yet several irregularly-shaped pits were identified (L113, L121, L124, L125, L128–L130, L132); they appear to have been purposefully cut into the husmas formation, possibly to extract building material for mudbricks. Some of these pits were excavated and were generally found to be shallow, containing an accumulation of dark brown occupation debris that included a few pottery sherds, groundstone vessels, flint artifacts, animal bones and shells (see below). These finds date the last use of this area, when the pits apparently went out of use, to the early stage of EB I. The finds are identical to those found in previous excavations in Areas E1, E2 and N, situated less than 400 m to the west and southwest (Golani 2004; Golani and Paran 2014). However, excavations in Areas E1 and E2 revealed many pits of bell- and barrel-shape that were purposely made for storage, while the pits in Area P appear to have been of a different character and purpose. One of the largest pits exposed in the excavation (L113; diam. 3 m, depth 0.4–0.5 m; Fig. 3) is rounded and its floor is leveled; it may have been used in secondary use for dwelling purposes. A slope in the northern part of the cistern, which ascends to the pit wall, may have been made purposely in order to provide a sloping opening to the pit (width 0.8 m). Across from this opening to its north was a small concentration of pottery sherds and faunal remains, possibly refuse that was thrown out of the dwelling. The pit was full of dark brown anthropogenic debris while at its center was a concentration of pottery sherds, faunal remains and small stones, a few of which appear to have formed a circular installation (diam. 0.15 m) that may have supported a roofing structure. Another relatively large pit (L121) found to the west of Pit 113 was similar in shape and size, yet did not exhibit signs of modification as a result of secondary use such as in Pit 113. Pottery and Groundstone Vessels. A few pottery fragments were found in the bottom of the pits; they are identical to those found in previous excavations at Ashqelon Afridar, Areas E, G and N, where they were dated to the early stage of EB I (Braun and Gophna 2004; Golani 2004; Golani 2014; Golani and Paran 2014). The diagnostic pottery is all handmade and poorly fired and includes V-shaped bowls (Fig. 4:1–6), some of which bear a red wash and burnish on their outer and inner sides (Fig. 4:4–6), a medium-sized short-necked jar (Fig. 4:7), simple holemouth jar rims (Fig. 4:8), massive jars with a sloping neck and short outturned rim with thumb-indented decoration (Fig. 4:9) and folded ledge handles (Fig. 4:10). A few basalt V-shaped bowl rims (Fig. 4:11) were also found. Flint Artifacts. 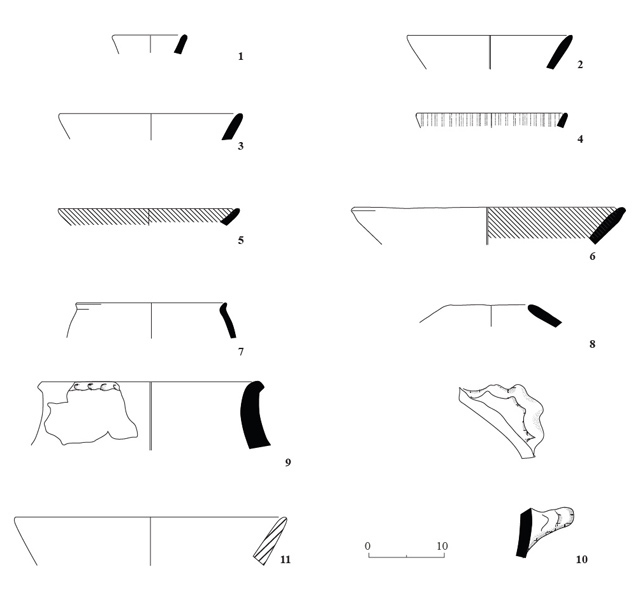 The lithic finds from the excavation amount to 33 artifacts (Table 1). 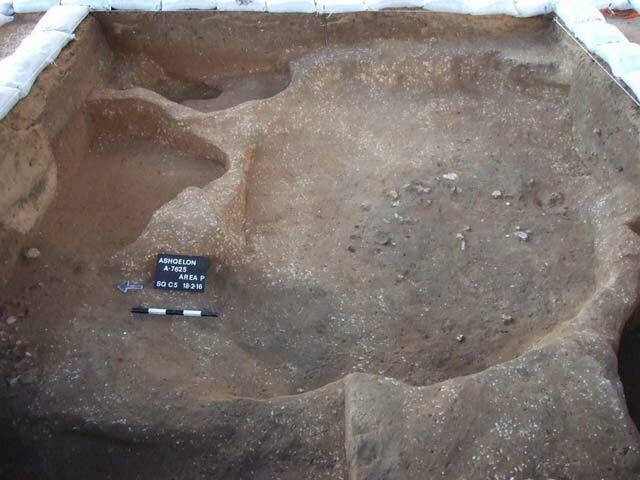 The presence of flakes and chunks attest to a local ad-hoc production, though no cores were found in the excavated area. Although a small assemblage, it includes several diagnostic artifacts. A tang fragment of an arrowhead (Fig. 5:1), is clearly attributed to the Pre-Pottery Neolithic B period. The tang bears a diagnostic pressure technique known as Abu Ghosh retouch. A complete bladelet made on chalcedony (Fig. 5:2) is characteristic of the Pottery Neolithic–Chalcolithic periods. Both items probably originate from the Neolithic site of Ashqelon, located 600 m to the north (Garfinkel and Dag 2008). The majority of the flint assemblage is associated with the Early Bronze Age and includes a fragment of a backed sickle blade (Fig. 5:3), a blade fragment made on a Canaanean blade (Fig. 5:4) and a fragment of a tabular scraper (Fig. 5:5). Faunal Remains. The excavations produced a small assemblage (N=33) of faunal remains (Table 2) that was retrieved through sifting from the fills within the pits. The cattle bones (46%) are the most common in the assemblage, followed by pigs (24%), sheep/goat (21%; including at least two definite sheep and one definite goat) and equids (9%; probably donkey) that are less common. Most of the identified bones are from the feet and head, which are usually considered waste products of the butchering process and therefore may have been purposefully disposed of in the pits. Shells. The excavation revealed a small collection of molluscs that comprise a typical selection that were usually found in the excavations of the EB period in the Ashqelon region. As the site is located near the seashore, the majority of these are Mediterranean species such as Glycymeris nummaria, Cerastoderma glaucum, Donax and Acanthocardia tuberculata. Some of these shells were found artificially perforated, which apparently indicates that they were used as pendants or counters. The molluscs from the excavation also include a small amount of Chambardia rubens, originating from the Nile river, possibly evidence of trade connections with Egypt during that time. The present excavations in Area P exposed an open area located on the eastern slope of the kurkar ridge. This area was apparently utilized for obtaining building materials, possibly for the construction of the structures in nearby Area O. It seems that at least one of the pits uncovered in Area P may have also been used for dwelling purposes. Baumgarten Y.Y. 2004. An Excavation at Ashqelon, Afridar—Area J. ‘Atiqot 45:161–184. Baumgarten Y. 2006. Ashqelon. HA–ESI 118. Braun E. and Gophna R. 2004. Excavations at Ashqelon, Afridar—Area G. ‘Atiqot 45:185–242. Garfinkel Y. and Dag D. 2008. 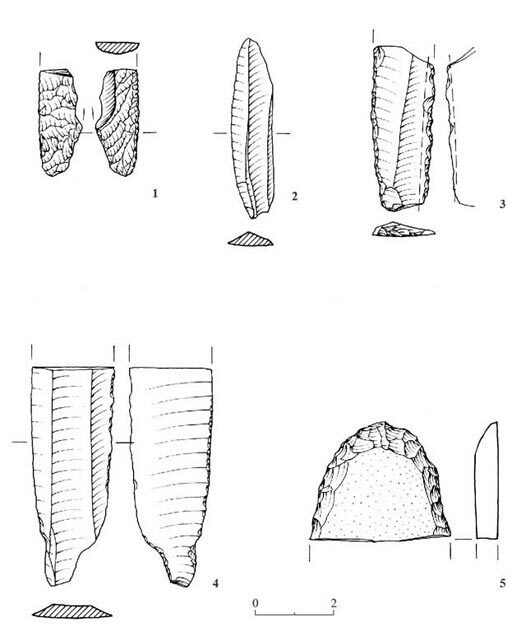 Neolithic Ashqelon (Qedem 47). Jerusalem. Golani A. 2004. Salvage Excavations at the Early Bronze Age Site at Ashqelon, Afridar—Area E. ‘Atiqot 45:9–120. Golani A. 2005. Ashqelon, Barne‘a B–C. HA–ESI 117. Golani A. 2007. Ashqelon, Barne‘a B–C. HA–ESI 119. Golani A. 2008a. Ashqelon, Barne‘a B–C. HA–ESI 120. Golani A. 2013. The Transition from the Late Chalcolithic to the Early Bronze I in Southwestern Canaan: Ashqelon as a Case for Continuity. Paléorient 39.1:95–110. Golani A. 2014. Ashqelon, Afridar Area N. HA–ESI 126. Golani A. and Paran N.S. 2014. Ashqelon, Afridar Area E2. HA–ESI 126. Gophna R. 2002. Afridar 1968: Soundings in an EB I Occupation of the “Erani C” Horizon. Beer Sheva 15:129–137. Haimi Y. 2009. Ashqelon. HA–ESI 121. Khalaily H. 2004. An Early Bronze Age Site at Ashqelon, Afridar—Area F. ‘Atiqot 45:121–160. Paran N.S. 2014. Ashqelon, Marina. HA–ESI 126. Toueg R. 2010. Ashqelon. HA–ESI 122. Wallach Z. 2003. Ashqelon. HA–ESI 115:58*–59*. 3. Pits 113, 124 and 128, looking east. 4. Pottery from the Early Bronze Age IA.